Ultimate Bachelorette Party is a comprehensive bachelorette party planning guide and directory. Our free articles plan every aspect including spas, restaurants, male revues, male strip clubs, hotels, nightclubs, limousines, party supplies, male strippers, drinks, invitations, bachelorette cakes and destinations. We'll help make your bachelorette party a very memorable one. Plan an unforgettable bachelorette party getaway. With so many destinations to paint red, the only difficulty comes in decid ing where to head. Here are a few ideas for where to gather the girls. The quintessential American bachelorette party destination, the Big Apple offers every obligatory diversion for guaranteeing a good time with your best ladies -- world-class shopping, spas, nightlife, restaurants (and, yes, male revues, too). 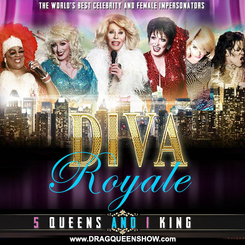 For a bachelorette party you will really remember Diva Royale Drag Queen Show really knows how to treat you like a queen. Be prepared for plenty of laughs, riveting Adele and Nick Minaj performances and, of course copious amounts of glitter. Ok, so you want to do at least one cheesy bachelorette activity that involves semi-naked men by way of speedos. For that, there's Hunk-O-Mania, New York City's permier male review. You can even arrange for the bride to be called up on stage. You will see more than you bargained for. On any given Spring and Summer weekend night, you'll see gaggles of newly bronzed ladies sauntering down the boardwalk and Atlantic Ave. to celebrate those precious pre-lifetime-commitment moments in one of America's most legendary locales for letting loose. Bachelorette gatherings in Atlantic City offer all the essential shopping (hit the Atlantic City Designer Outlets for big brands as well as funky vintage finds), partying and nightlife elements -- with the added appeal of beach time mixed in. Many hotels offer packages for bachelorette groups. Caesars -- a super hip and surprisingly affordable chic hotel on the boardwlak -- touts a "Style the Last Mile" bachelorette package, whereby special room rates include manis, pedis and group massages for your entourage, VIP club passes and nightly martini rounds during the hotel's happy hour. Be sure to book your flights back home as late as possible on Sunday so you can have a last hurrah at the oceanfront club Bikini Beach Bar, where SoBe's no-rest-for-the-wicked set dance with their toes in the sand from midday till long past midnight. If your ideal bachelorette party is more about classy dining and nightlife than hog-wild hurrahs, pass on Atlanta and opt to round up the ladies for a low-key weekend of Midwest comforts in Chicago instead. The city's natural beauty and built-in grace make it one of America's top-ranked wedding destinations. But there's a lot for a crew of close friends to like about quality time together here, too. Consider renting an apartment or house for the weekend, with forays into the primary shopping strip; Magnificent Mile, which runs along north Michigan Avenue from the Chicago River to Oak Street. Here you'll find department stores such as Bloomingdale's, Lord & Taylor and Nordstrom shopping and dining. In the evening, you must dine at "Park Grill" then head over to the number one bachelorette party destination in Chicago "Hunk-O-Mania" for a night of clean debauchery fun. A party scene that goes off every night of the week, great outlet shopping, world-class spas and the diversion of Disney, Universal and SeaWorld (check out the latter's newly opened water park, Aquatica) lend Orlando big bachelorette party appeal. Get away from the family crowds by basing yourself in downtown Orlando at the swank Grand Bohemian Hotel, a stone's throw from scores of tourist-free bars like Sky 60 (for a cool rooftop scene) or The Beacon, where South Beach meets Central Florida. If you prefer to have your fun out at the parks, party like a rock star by booking into Hard Rock Hotel at Universal Orlando Resort, where free boat shuttles are your designated driver to CityWalk's always-on clubbing, live-music and dining scene. Portofino Bay Hotel, also at Universal, has one of Orlando's premier pools. And if a spa outing is among your plans, the Canyon Ranch SpaClub inside Gaylord Palms Hotel offers one of the most decadent venues in the country. On any given weekend night, you'll see gaggles of newly bronzed ladies sauntering down Collins Avenue and Ocean Drive to celebrate those precious pre-lifetime-commitment moments in one of America's most legendary locales for letting loose; Miami Beach is also home of the Ultimate Bachelorette party destination in the country: Hunk-O-Mania Bachelorette gatherings in South Beach offer all the essential shopping (hit Lincoln Road for big brands as well as funky vintage finds), partying and nightlife elements -- with the added appeal of beach time mixed in. Many hotels offer packages for bachelorette groups. The Catalina Hotel & Beach Club -- a super hip and surprisingly affordable art deco hotel on Collins Avenue -- touts a "Style the Last Mile" bachelorette package, whereby special room rates include manis, pedis and group massages for your entourage, VIP club passes and nightly martini rounds during the hotel's happy hour. Be sure to book your flights back home as late as possible on Sunday so you can have a last hurrah at the oceanfront club Nikki Beach, where SoBe's no-rest-for-the-wicked set dance with their toes in the sand from midday till long past midnight.